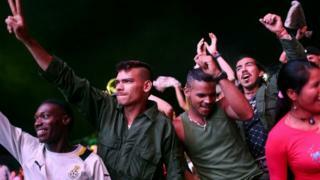 Colombia's largest rebel group has given its approval to a peace deal agreed with the government after nearly four years of talks. The announcement of the unanimous decision by Farc members was made at the end of their conference. "The war is over," said the group's chief negotiator, Ivan Marquez. Colombian President Juan Manuel Santos and Farc leader Timoleon Jimenez, known as Timochenko, will sign the agreement at a ceremony on Monday. But the deal will only be implemented if it is approved by the majority of Colombian voters in a referendum on 2 October. The Farc's 10th Conference was held in the remote Yari plains region, one of the group's strongholds in southern Colombia. On the final day of the conference Timochenko addressed hundreds of rebels and described peace as "the most beautiful of victories". He urged the government to honour the agreement and "deliver social justice and land reform" along with a lasting peace. "The Farc reaffirms its commitment to what has been agreed. If the government also follows the terms agreed, the lives of ordinary people, especially in rural areas, will improve considerably," he said. "The whole population will benefit from peace, which will reduce violence and will free resources from security to be invested in new infra-structure projects," added Timochenko. The Marxist group has been fighting the Colombian armed forces since 1964. An estimated 220,000 people have died in the conflict. More than six million people have been internally displaced. A final peace deal between the two sides was announced on 24 August in the Cuban capital, Havana, where the negotiations took place. Five days later a bilateral ceasefire came into force, effectively ending the conflict. "Never again will parents be burying their sons and daughters killed in the war,'' Timochenko told journalists. "All rivalries and grudges will remain in the past," he said. Mr Santos announced 2 October as the date for the referendum and urged the Colombian people to embrace peace. One of the Colombia's "most painful chapters" was coming to an end, he said. Earlier this month the Farc handed over a first group of child soldiers as part of the peace accord.